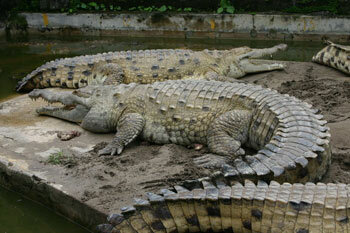 Orinoco Crocodiles have a body length between 3 and 4 m (9.8 - 13 ft). They are pale green/yellow in colour and they have short, powerful legs and a long, powerful tail. 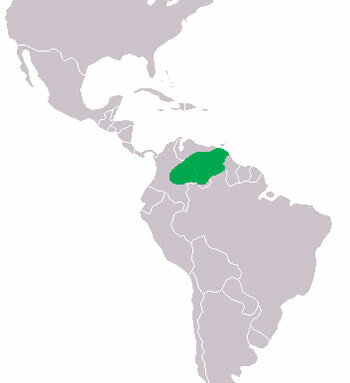 Orinoco Crocodiles are restricted to the Orinoco River and the Meta River drainage basins in Columbia and Venezuela in South America. Orinoco Crocodiles mainly feed on reptiles, birds, mammals, fish and invertebrates. Orinoco Crocodiles breed during the dry season and 14 weeks after mating the female will dig a nest in a sand bank and lay her eggs. After approximately 3 months the young crocodiles hatch and call out to their mother. She will dig out the youngsters, carry them to the water and she will defend them until they are a year old. Humans are the main predators of adult Orinoco Crocodiles. Youngsters are preyed upon by caimans, anacondas, tegu lizards, american black vultures and other carnivores. Orinoco Crocodiles are the largest predator in South America.